The reason given is that "the way in which we communicate with each other has profoundly changed," and after the mid-December cut-off date the service will cease to function, and all data will be erased. There are currently no plans to build a replacement for AIM, but Oath says that it is "excited to continue bringing you new, iconic products and experiences." If you were hoping to export the contents of your AIM account for nostalgic purposes, you're out of luck. Oath says that "unfortunately you are not able to save or export your Buddy List," and "your data associated with AIM will be deleted after December 15, 2017." As of December 15, 2017, AOL Instant Messenger products and services will be shut down and will no longer work. We know there are so many loyal fans who have used AIM for decades; and we loved working and building the first chat app of its kind since 1997. Our focus will always be on providing the kind of innovative experiences consumers want. We're more excited than ever to focus on building the next generation of iconic brands and life-changing products. It's not all bad news, however. It is possible to save files and images that have been swapped back and forth between you and your "buddies". You can also save chat logs, and Oath has provided details of how to do this over on the AIM help pages. Many people will be surprised that AIM is just being killed off out of the blue with no suggestion of a sale to a third party. 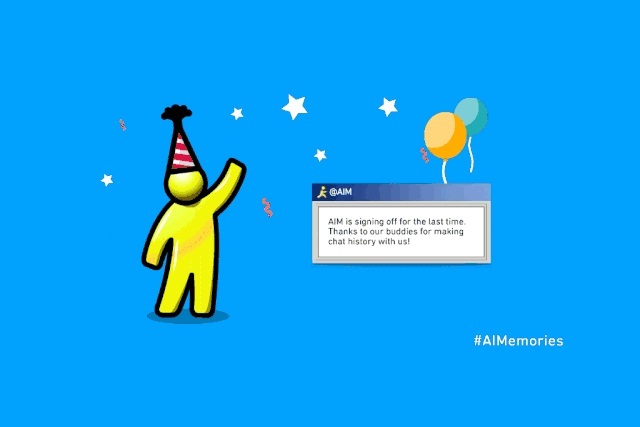 But whether you loved or hated AIM, one thing's for sure -- this is the end of an era.